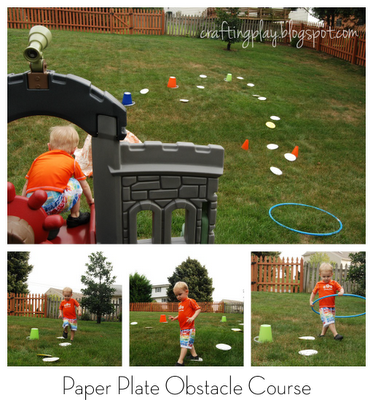 Toddler obstacle courses are great for gross motor skill development and also for practicing problem solving skills. This weekend I made a quick obstacle course for Ethan using a stack of paper plates as the base for the course. I placed them in the yard and wove them around some upside down sand pails and some plastic cones (left over from our Construction birthday party). I showed him to follow the plates, stepping on each one along the way. I put a hula hoop on the ground at the end of the plates and instructed Ethan to jump into it and jump back out. Also part of the course was his climber (the starting point) and a tunnel made out of a small slide and a blanket (a blanket over a chair would work great too). The highlight for Ethan was stepping on the plates and following the plate trail. He loved that. After he jumped into the hoop, he decided that he'd wear it on his next lap around the course. Way to go! He also moved the blanket to another location on his climber where he preferred to have the tunnel. It was a lot of fun, although we didn't really get to play for long before the heat and bugs brought the course to a natural end. We saved the paper plates so we can play again later. Maybe next time we'll create a crawl tube using a cardboard box. Have you had any experience with toddler obstacle courses? Any other good obstacle ideas for our next course? ?